The Belgian Landrace is a muscular white swine with heavy droopy ears. They are known as the butchers pig, primarily because they are the most commonly used breed for the consumer market. The Belgian Landrace can be described as a very practical type of pig with good fertility, sound body mechanics, and good maternal instincts, and plenty of milk for their piglets. The Belgian Landrace has met the demands of producing top quality pork for the consumer marketplace. The breed has also sparked interest from other countries with similar goals in crossbred swine production. The Belgian Landrace breeds development began in the late 1920s, with the native Landrace type, which sought to improve their short, fat, and poorly muscled traits. In the early 1930s, the German Landrace was introduced and crossed with the native stock. The German stock that was introduced was said to have had an infusion of British Large White. About a decade later, the Dutch Landrace breed was imported and crossed with the Belgian Landrace to boost their fertility, constitutions, stature, and to speed up growth. Producing a high quality, fresh, lean meat, with minimum fat cover, is the number one goal in Belgium. Most pork is marketed to consumers as fresh pork, rather than as cured or processed. Overall, Belgium continues to test their swine and monitor production very carefully while striving to improve quality. 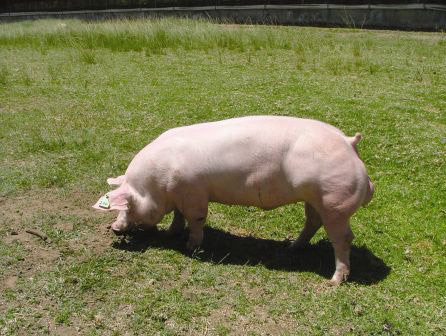 This breed is an excellent example of selective breeding and crossbreeding that consistently produced top quality pork.